'Canadians Are Livid' About Trump And Are Hitting Back By Boycotting U.S. Goods "The brutality of American politics right now is something that is profoundly shocking to Canadians," says a former Trudeau adviser. "I think many people feel they do not recognize the U.S. anymore." President Trump meets with Canadian Prime Minister Justin Trudeau at the G-7 summit in Charlevoix, Canada. Chamberlain says he began scouring labels shortly after the Group of 7 summit in Canada in early June, when President Trump called Prime Minister Justin Trudeau "meek and mild" and "dishonest & weak." Across Canada, people are increasingly shocked and angry about the way the country is being treated by the Trump administration. 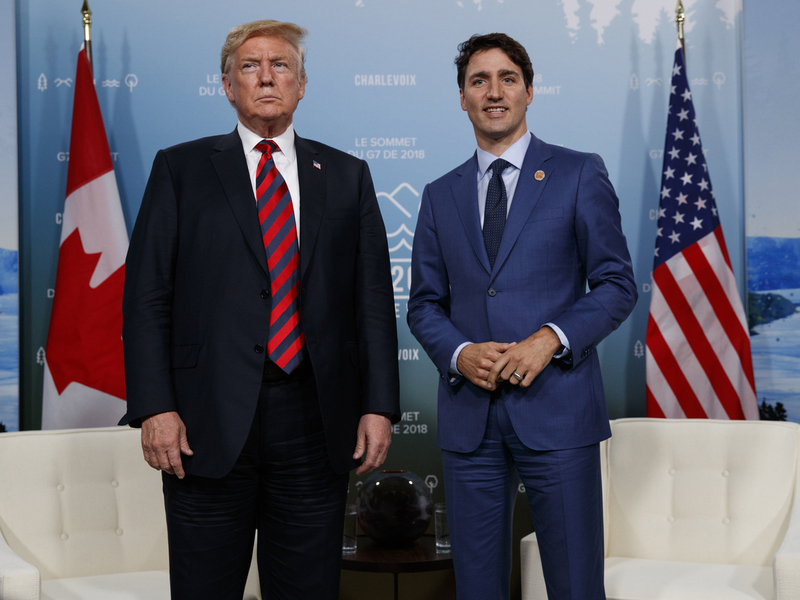 They've watched as the U.S. has slapped steep tariffs on Canadian products, listened to President Trump harangue Trudeau and discovered the U.S. now considers their country a national security threat. Things began to go downhill in late May, when the U.S. imposed tariffs of 25 percent on Canadian steel and 10 percent on aluminum. Trudeau angrily rejected the U.S. rationale for the tariffs — that dependence on other countries' aluminum and steel posed a national security threat — as "insulting and unacceptable." Trump then lashed out at Trudeau for holding a press conference critical of U.S. trade policies at the G-7. He warned that Trudeau's criticism "[is] going to cost a lot of money for the people of Canada." Trump's trade adviser, Peter Navarro, piled on, saying Trudeau had earned a "special place in hell." Navarro later apologized. But Canadians were outraged. Now, from British Columbia to Newfoundland, they are protesting the Trump administration with their pocketbooks. The U.S. and Canada trade roughly $2 billion worth of goods and services every day. Chamberlain, a lawyer and father of four, is part of a fast-growing social media movement to buy only Canadian goods. Hashtags include #BuyCanadian, #BoycottUSA and #TrumpFree. Chamberlain says if he can't find a Canadian product, he'll look for something from elsewhere — as long as it's not from the U.S. He points to a display of cherries in the supermarket. "Bing cherries or Rainier cherries are probably going to be a product of the United States," Chamberlain says. He decides to buy Mexican grapes. "They're very similar," he says. "Actually, I'll probably end up spending less buying the grapes." Chamberlain says he was proud of the way Canada supported Trudeau after the G-7 summit. Even Trudeau's political enemies vowed solidarity with the prime minister. And as a personal protest, he decided to boycott American goods. "Maybe it was a spontaneous act of patriotism," he says. Many Canadians are wondering how a once-strong relationship with the U.S. has deteriorated so quickly. "Canadians are livid; the anger is across the country," says Roland Paris, a professor of international affairs at the University of Ottawa and a former foreign policy adviser to Trudeau. He says Trump may be using tariffs and undignified language as leverage for trade deals, such as the ongoing North American Free Trade Agreement talks, but Canadians are shocked at being treated as an adversary. "If President Trump's goal is to try to soften up his negotiating partner by issuing threats, it's having the opposite effect, because people are more resolved to stand up against this kind of bullying," he says. The Canadian government says it will levy dollar-for-dollar retaliatory tariffs against the U.S. on July 1, Canada Day. These will include steel and aluminum, along with other products — such as bourbon from Kentucky — that will particularly hit states aligned with Trump. Gary Howe, the president of the United Steelworkers Local 1005, in Hamilton, Ontario, says his members aren't panicking yet about a possible trade war with the U.S. The bigger concern is what's happening on the U.S.-Mexico border. "You know, the kids that are separated from their parents — I mean, it really makes Trump look to be like quite a monster," he says. "I think that most Canadians would kind of view him as ... quite an evil person, you know, because that's the way that the [Canadian] media has been kind of presenting it." Paris says many Canadians have relatives and friends in the U.S. and understand it is a big and complex country. "Nevertheless," he says, "the chaos, the meanness, the brutality of American politics right now is something that is profoundly shocking to Canadians and I think many people feel that they do not recognize the U.S. anymore." Gordon Ritchie, Canada's ambassador for trade negotiations in the 1980s and one of the principal negotiators of the original Canada-U.S. free trade agreement, says the tariffs and tough talk have created a breach of trust — but the relationship will survive. "I think the Canadian-American relationship — in political and economic terms — is very, very close and it will outlast this president," he says. In the meantime, he believes Canadians will continue to voice their disapproval with the Trump administration through the #BuyCanadian movement. He predicts that will extend to the tourism industry as well. Three of his neighbors who spend time in Florida every year are now looking for new vacation spots outside the U.S.